Flush with $1 million in Kickstarter cash, Neeo wants to be the first smart home remote that won't scare the heck out of normal people. Neeo's candy bar remote consists of a high-resolution touch screen on top and a sparse layout of buttons underneath for things like pausing, adjusting volume, and changing channels. The remote pairs to a “Brain” hub, which packs an IR blaster and four antennas for communicating with smart home and home entertainment products. Why this matters: The general concept is not new. You can already buy a Logitech Harmony remote, for instance, with a touch screen and physical buttons, and pair it to a companion hub that talks to all the other devices in your house. Neeo is just hoping to stand out on execution, with slicker hardware and simpler device pairing. When you set up a Logitech Harmony remote, you first have to poke around your living room and write down the model numbers for all your devices. You then have to plug the remote into a PC, and use Logitech's website to manually add each model number. By comparison, Neeo claims that it can pair devices at any time directly through the remote's touch screen, just by typing in the product name. 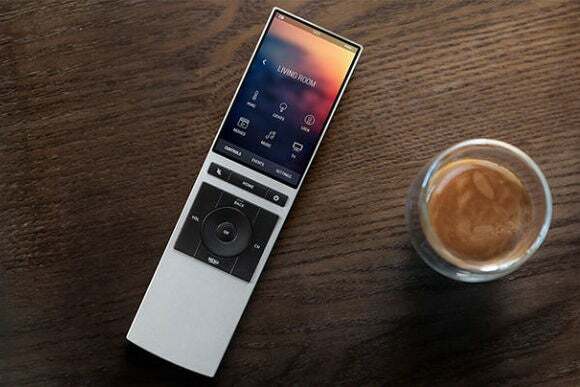 Neeo's remote also looks less intimidating on the outside, with far fewer physical buttons and more controls relegated to the touch screen, and the company claims it will offer user-specific profiles through palm recognition. In addition to the remote, Neeo will offer an iPhone and Android app. As for device support, the antennas inside the brain will support most of the big networking methods, including Bluetooth, Wi-Fi, ZigBee, Z-Wave, Thread, and 6LowPAN. 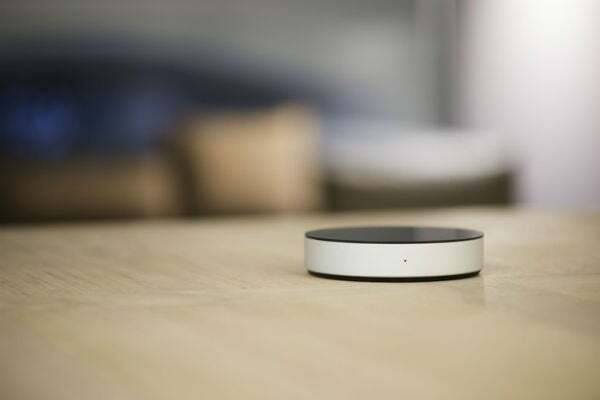 Neeo plans to work with Roku, Apple TV, Western Digital TV, Xbox, Sonos, Philips Hue lighting, Nest thermostats, and many cable and satellite boxes. It also claims compatibility with 55,000 television models, 19,000 DVD and Blu-ray players, and dozens of projectors. An IR learning process is included for devices that don't work out of the box. Neeo's brain connects to entertainment centers and smart home devices, and is controlled by remote or smartphone app. On Kickstarter, Neeo is charging $250 (with $219 early bird pricing) for a remote and Brain. The retail price will be $299, and Neeo is hoping to ship to backers in March. This is crowdfunding we're talking about, and that seems like an awfully aggressive estimate, but the videos on Neeo's Kickstarter page show fully-working prototypes rather than hopes and dreams. Given the funds raised so far, it seems like plenty of people are willing to believe in a simpler universal remote.